Home Schooled: Teens Build Houses in Essex Tech Program | Features | Kids VT - small people, big ideas! When they graduate from high school, students enrolled in the residential building class at the Center for Technology, Essex, will have something other than a diploma to show for their work: a 2,900 square-foot, four bedroom, two-and-a-half bath colonial. They're installing Sheetrock in it now. The house, at 28 Taft Street in Essex Junction, is expected to be ready for sale in early June. 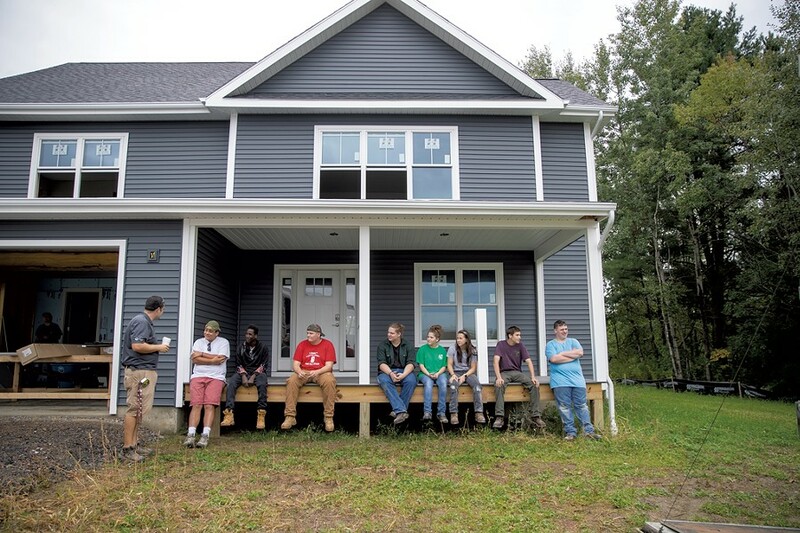 Students in the Essex program — with help from professional, licensed contractors — build one house every two years. The Taft Street home is the 25th Essex tech students have constructed to sell. They have built all of the homes on Taft and nine on neighboring Drury Drive. "So, we've actually built a neighborhood of houses right next to our tech center," said principal/director Bob Travers. "They're monuments to all of the students we've had in the past," said Travers, who likes to point out that his school, via the home sales, actually contributes to its own tax base. The Essex tech center is one of five in Vermont that builds houses on site, according to Jay Ramsey, the state director for career technical education. Three other tech centers build modular houses in their shops, and three have built tiny houses. 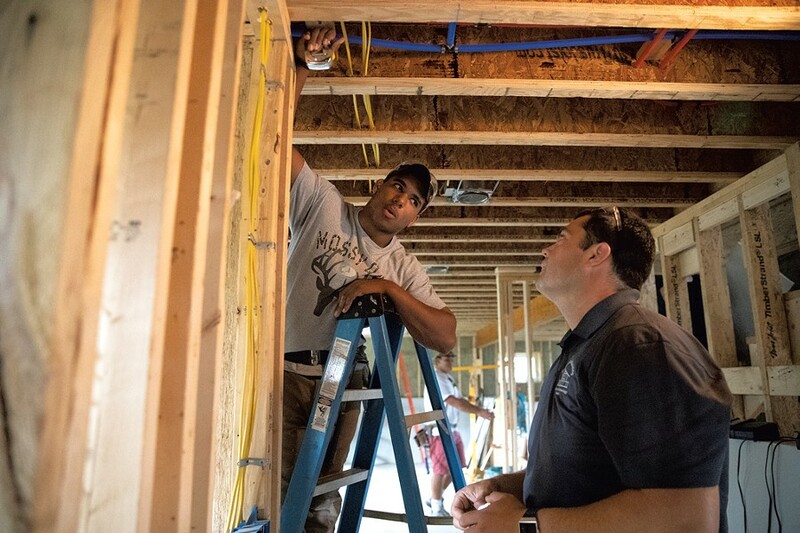 Home-building classes, like career and technical education in general, provide a context for academics and a means to try out careers without accumulating student loan debt, Ramsey said. "Many individuals have used college as the exploration opportunity," he said. "And it's kind of expensive to do that." Vermont has 17 career and technical centers, and is one of only a handful of states to have regional tech centers, rather than tech education at individual high schools. Essex's tech center, for example, serves eight high schools in Chittenden County, as well as Bellows Free Academy, Fairfax in Franklin County. Collectively, the centers offer a wide range of classes, including forestry and natural resources, criminal justice, auto body repair, aviation and aerospace technology, dental assisting, and cosmetology. If the center in your region doesn't offer the class you want, you can take it at another center. Last year, 30 percent of Vermont 11th and 12th graders took at least one class at a tech center. Some classes award both high school and college credits and hours toward professional licenses. 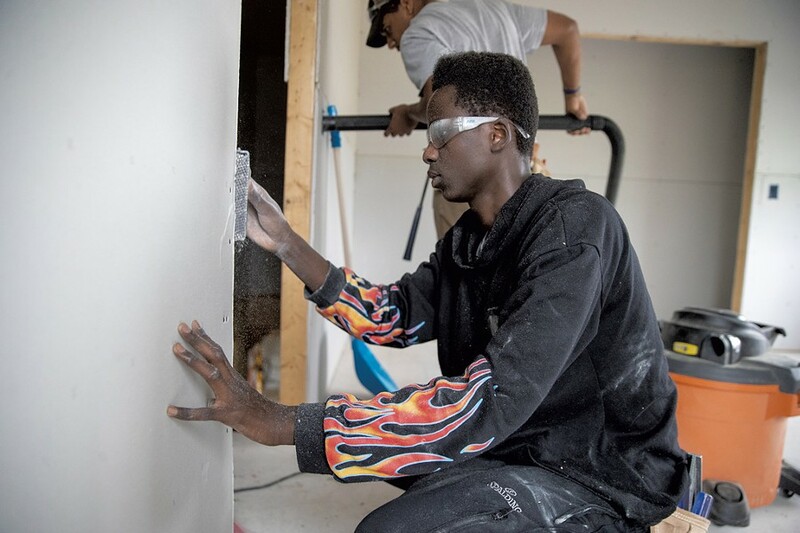 Students in Essex's Building Technology: Residential class earn six high school credits, CPR and First Aid certifications, as well as an Occupational Safety and Health Administration 10-hour card, awarded upon completion of OSHA's 10-hour safety course. The class is open to juniors and seniors; 21 are enrolled this year. Two aren't working on the house; they have full-time co-op jobs, one with Omega Electric Construction and the other with Bread Loaf Corporation. For the other 19, class starts in a low slung, metal-sided building at the end of a gravel drive. On a recent Friday, dates for upcoming events, including school picture make-up day, OSHA training and the tech center's open house, were projected on a screen under the motto, "Safety First, Quality Second, Quantity Last." 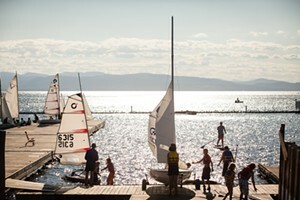 After announcements, instructors Chris Welch and Matt Bruneau got to the business of the day. A load of half-inch Sheetrock had arrived the day before, and students would start installing it on the second-floor walls. Bruneau, whiteboard marker in hand, asked the class to name the tasks involved in installing drywall. Bruneau wrote it on the board. "That's a job; what's another one?" "Measuring, cutting; what else?" Bruneau asked. Welch offered a hint. He and Bruneau stood together at the front of the room, effortlessly dovetailing their instruction. Welch has worked in information technology and built houses with Habitat for Humanity, as well as his own home. Bruneau is a former housing contractor who has built three houses by himself. Think about the upper piece of Sheetrock going on a wall, Welch told the kids. What does it require? And Bruneau got the answer he was looking for: "Holding it." The students — 17 boys and two girls — listened attentively. They wore work clothes, some in sneakers and T-shirts; others in steel-toe or composite-toe boots and carpenter pants. Baseball-style caps and camo dotted the room. They would divide into groups at the house. Bruneau listed the tools each group would need and the tools they would share. Welch told them to install Sheetrock on exterior walls first because once interior walls are up, it's harder to move Sheetrock around. Bruneau drew diagrams to illustrate how to stagger the panels and where to put the screws, and he suggested a technique for cutting out windows. Then he collected everyone's cellphone — fewer distractions promote safety on a job site — and the class left the building, walked on a grassy path, past community gardens and the forestry and horticulture program's apple orchard, to the construction trailer parked in the driveway at 28 Taft Street. Last year's class worked with students in the Natural Resources: Mechanical and Small Engines program to prepare the site. A contractor dug the basement, then students helped a concrete contractor frame up the foundation and footings. Other work — plumbing, electrical and roofing — was also done by licensed contractors (the roofer is an Essex tech alum), with students assisting whenever possible. Students framed the house, built floors and walls, and installed windows, doors and insulation. They even got the vinyl siding installed, a task that had been scheduled for this school year. "We're a little ahead of the game right now," Welch said. This year's students will build a deck and two sheds so they can get framing experience. On that September Friday, they gathered tools from the trailer, tightened construction belts and put on safety glasses. Crews in each room measured and marked the location of windows, light switches and outlets on the drywall. In no time, the bzzt of impact drivers firing screws into studs filled the house. In the second bedroom, three students held an 11-foot, 10-and-a-half-inch length of Sheetrock flush to the ceiling while Essex High School senior Matt Russell climbed the ladder with an impact driver. Bzzt! A screw flew into the top right corner. "Whoa, Matt! There's something sticking out in the wall there," Essex senior Keshon Peters said. A small object had cut through the Sheetrock. "No putty will fix that," said Phillip Danis, 17, who is homeschooled in Essex. "I would suggest, take it down." Matt put the impact driver in reverse, and the rest of the crew, which also included Winooski High School junior Sharmake Ali, lowered the panel to the floor. A nail protruded from the top of the wall. The team pounded it down, flush with the frame, then raised the Sheetrock again. Students take this class for a variety of reasons. Phillip wants to travel and work in interesting locations. "It's great paying work if you know what you're doing, and you can get a job almost anywhere," he said. Keshon wants to enlist in the Marine Corps. He took the class to learn life skills and to get out from behind a desk. "It's nice learning this way," he said. Sharmake and Essex High's Noelle Rosberg want to build their own homes. South Burlington High School senior Brandon Posey, Burlington High School senior Elliot Maher and Milton High School senior Ethan Maynard all want to be electricians. Colchester High School senior Dylan Roberge has already accumulated 450 hours toward the 8,000 needed to test for a journeyworker electrician's license. Josh Walp of Mount Mansfield Union High School said he's considering becoming an electrician or a plumber. There's room for another 13 houses on this parcel, which is owned by CTE Corporation, the nonprofit that finances the home-building program. The last house to be completed, in 2016, was designed to be a net zero house, able to operate off the grid. Solar panels on the roof can generate enough energy to meet the home's power demands, walls are nearly one foot thick and special insulation and windows were installed. The three-bedroom ranch with a walkout basement sold for $431,700, not a first-time homeowner price, said Rich Gardner, the real estate agent who handled the sale. "It's not a house that's slapped together by kids. It's a house that's professionally built with kids that are part of the process . . . They are well-built homes," he said. Students probably spend more time talking about details than commercial builders, said Gardner, owner of the Gardner Group and co-owner of Re/Max North Professionals. "You couldn't have a construction company and sell one house every two years." Ron and Judith Frey bought the Taft Street ranch students completed five years ago. "I think it was sort of a plus that we were helping the school and the kids out," Ron said. The home is well insulated and has an energy-efficient design, Judy said. It was inspected and came with a one-year guarantee. If anything went wrong, students would fix it. The couple had some minor plumbing problems. "But that wasn't done by a student; that was done by a contractor," Ron pointed out, and the plumber made repairs. "The things that the students did, we didn't have any problem with." When the couple wanted a shed and a ramp to make their home wheelchair-accessible, they hired Essex tech students to build both. 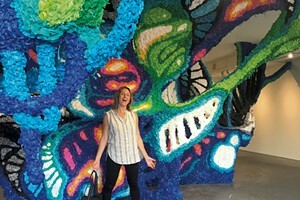 At the start of past school years, when building instructors wanted to show their students what their work would produce, they took them to the Freys' home for a tour, and Judith baked them cookies. "I think building a house as part of a high school program is unique," said career technical education director Ramsey. It's "certainly a point of pride for students to be able to sit in a car with their parents and drive through this neighborhood and say, 'Look, I'm building that.'"